Another home game, another win and this one was extremely impressive as Kettering Town dispatched Banbury United 3-0 at Latimer Park. 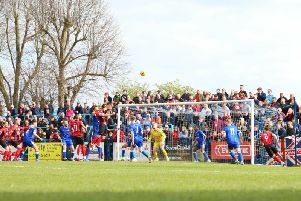 With two perfect records on the line - the Puritans had won every away game in the Evo-Stik South League Premier - it was only the Poppies’ 100 per cent start at home that looked like surviving. The fact that Paul White, who will now serve a three-match ban following his red card at the weekend, had just one serious save to make all night pretty much tells the story. The Poppies restricted the free-scoring visitors to nothing but scraps all evening while, at the other end, they continually caused problems. The tone for the evening was set early on as the returning Michael Richens fired a 35-yard warning shot just off target. And once Kettering got a grip on proceedings, there was no looking back. The breakthrough came just past the quarter-hour. A succession of corners piled the pressure on the Banbury defence. And, after Ben Milnes whipped another cross in, they finally caved in as the ball broke for Brett Solkhon, who can’t put a foot wrong at the moment whether he’s in goal or outfield, and he made no mistake from close-range. With their tails up, the Poppies went for the kill and Rhys Hoenes, who produced an action-packed display, had a shot blocked after being released by a magnificent pass from Rene Howe. Gary Mulligan headed just off target and Richens went even closer before the break when he shot wide after being teed up by the central defender. While Banbury enjoyed plenty of possession across their back line and in the midfield, they rarely troubled the well-marshalled home defence. White made his only real save when he pushed away a well-struck 30-yard effort from George Nash after 65 minutes. But just three minutes later, a moment of brilliance gave the Poppies a cushion. Milnes won a free-kick just outside the area. And then he lined it up and brilliantly curled it into the top corner on goalkeeper Jack Harding’s side. It was just too good for him. That proved to be the job done but Richens demonstrated the determination to keep a clean sheet with a brilliant last-ditch challenge to deny Darren Pond as he broke clear on goal. The game appeared to be petering out but Kettering were still able to add an exclamation point in stoppage-time. The tireless Hoenes was hauled down in the area and while the winger wanted the spot-kick, Howe took responsibility and made no mistake from 12 yards to wrap it up. That’s September done as far as the league is concerned. Kettering sit on top of the table for the time being with eight wins from nine matches. They are doing their best to prove that they are a real force to be reckoned with this season. Poppies: White; Berry (sub Bateman, 49 mins), Mulligan, Solkhon, Toseland; Hoenes, Richens, Milnes, Meikle (sub Baker, 86 mins); Howe, O’Connor (sub Stevens, 71 mins). Subs not used: Stohrer, Sundire. Banbury: Harding; Westbrook (sub Winters, 72 mins), Carnell, Bradbury; Hawtin, Self (sub Shamsi, 69 mins), Nash, Pond, James (sub Martain, h-t); McDonagh, Louis. Subs not used: Peake-Pijnen, Howards. Goals: Solkhon (16 mins, 1-0), Milnes (68 mins, 2-0), Howe pen (90 mins, 3-0). Bookings: Pond, Nash, Shamsi (all fouls).